THEY HAVE taken on the world of Shakespeare, but now the legendary trio are finally tackling the subject they were born to reduce. From the high-brow to the low, The Complete History of Comedy (abridged ) covers comedy from Aristophanes to Shakespeare to Charlie Chaplin to Chris Rock. 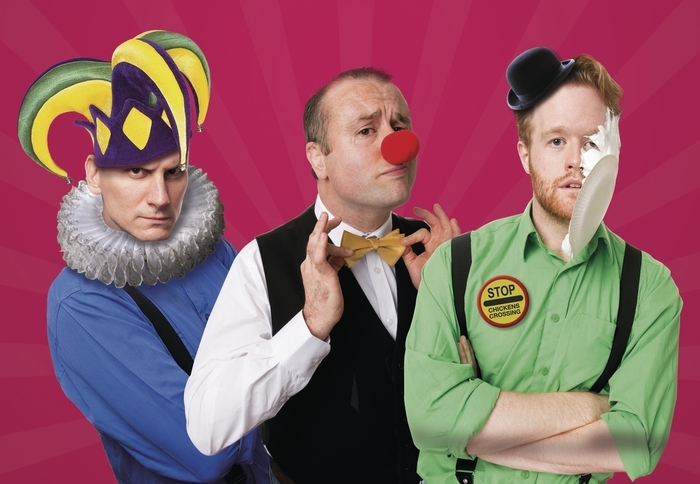 This new show, which The Stage declared “proves the Reduced Shakespeare Company have not lost their touch”, and British Theatre Guide (2014 ) said was “70 minutes filled with laughter”, comes to the Town Hall Theatre on Tuesday April 14 at 8pm. Written and directed by Reed Martin and Austin Tichenor, it leaves no joke untold as it deconstructs the entire history of comedy. Since 1981, the trio have created nine stage shows, two television specials, and numerous radio pieces. Its shows, The Complete Works of William Shakespeare (abridged ), The Complete History of America (abridged ), and The Bible: The Complete Word of God (abridged ) enjoyed a nine-year run in London. These shows have continued to enjoy performances up to 2013 and 2014.